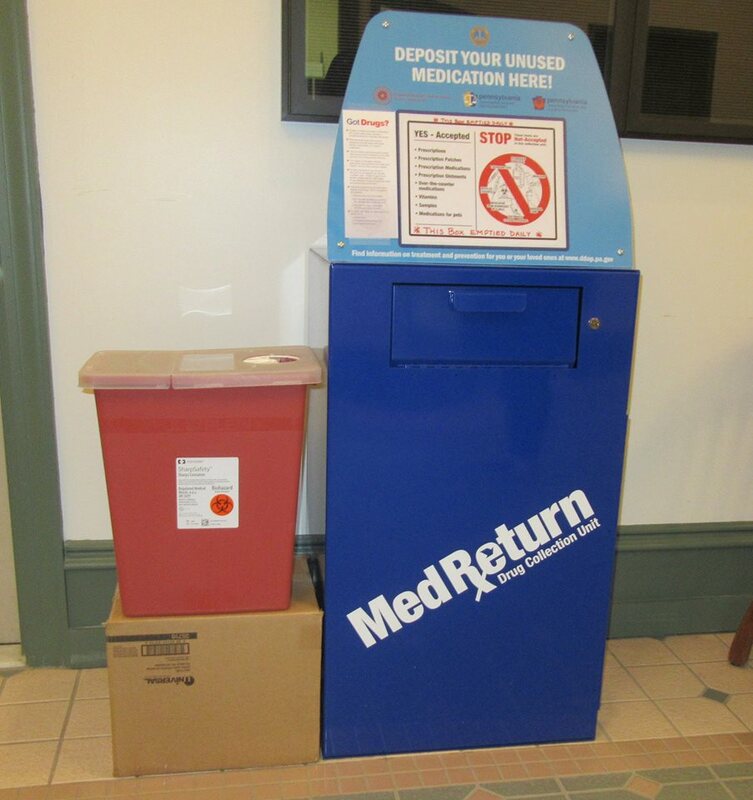 A depository for new syringes (above, left) was temporarily placed in the entrance lobby of the Wyoming County Courthouse on Tuesday morning next to a drug take-back box. It will eventually be more permanently placed on a table or stand. 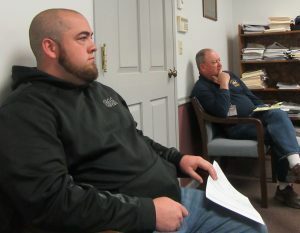 Many business items were discussed at the May 16 meeting of the Wyoming County Commissioners in addition to the flood buyouts (read here: http://www.endlessmtnlifestyles.com/?p=7501). Among them were the formation of a new fire chiefs group, the BPW “Woman of the Year” announcement, and the installation of a depository for used syringes at the courthouse. In response to a growing number of needles being picked up during roadside cleanups and in municipal parks, as well as a decrease in the number of pharmacies that will take back syringes used for legitimate purposes like insulin injections, Wyoming County has contracted with Bio Hazard Solutions of Nesquehoning for a syringe depository that has been placed on the first floor of the courthouse in Tunkhannock. Bio Hazard charges $28 per visit to retrieve the needles, which will be timed with monthly visits to the Wyoming County Jail, where a similar box is already in place. Commissioner Judy Mead (above, left) suggested that a letter be sent to area pharmacies so they can make their customers aware of the service. The commissioners approved but did not read a proclamation citing Janice Shaffer as “Woman of the Year.” Shaffer and her husband, Ed, expanded the Pink Apple Restaurant west of Tunkhannock from a roadside fruit stand and dairy bar from the 1960s to the ’80s before buying and running Shadowbrook Inn & Resort and helping their daughter run the Skyline Motel. In her “retirement,” Shaffer and her daughter opened the Seven Loaves Soup Kitchen in Tunkhannock. Shaffer will be honored at a meeting of the Tunkhannock Business & Professional Women on Saturday evening. 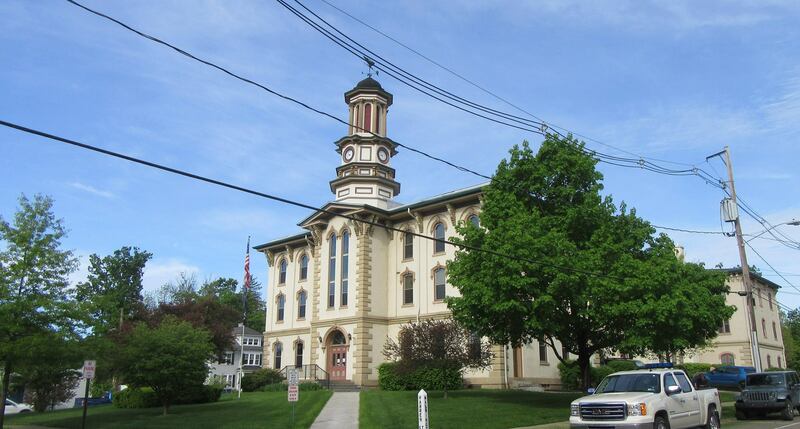 The commissioners approved a feasibility study for the installation of a natural gas line from the area of Shadowbrook to Tunkhannock Area High School, which would also service the Middle School, the Jail, the Courthouse, and the 911 Center. “There could be many legs off this line if it works,” Henry said of the potential to make natural gas available to residential customers as well. If feasible, the use of natural gas would bring about substantial savings to tax payers. The school, Henry noted, is entirely electric. The study cost is capped at $110,000. In response to the Procter & Gamble warehouse fire in January, a group of fire chiefs has been formed in Wyoming County with two delegates from each company. The first officers of the new group are President Scott Hayward, Meshoppen Fire Chief; Vice-President Chuck Story, Northmoreland Fire Chief; and Bert Dana, Triton Assistant Chief. Key items that were discussed at their first meeting included standardization, personal accountability and communications – the latter two especially as they pertained to outside agencies. In a letter to the commissioners dated May 12, the officers noted that, while they opted not to include representatives from 911, EMA, GIS, Red Cross and other agencies in the new group, they are already working with such entities to achieve their common goals. For example, EMA director Gene Dziak is working with them to find an efficient and cost-effective personal accountability system, and 911 director Jeff Porter was cited in the letter for helping the group close a gap in communications with groups outside the county. Chas Mead and Keystone College intern Jacob DeRoberto were credited for work on a grid system to be combined with 911 dispatching for better mapping and location of uncommon addresses, new lanes, and updated road information. 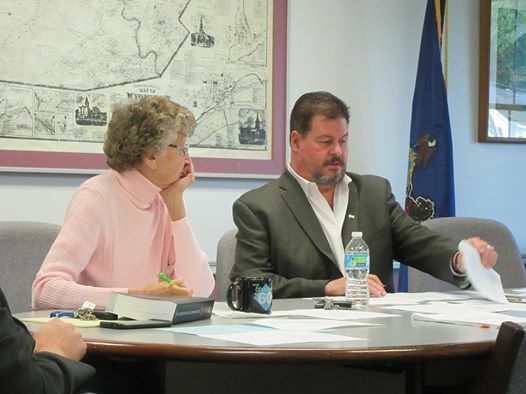 Porter was at the commissioners meeting as the board approved a modification to a recently established contract with Chesapeake Energy for the lease of space on a county-owned communication tower in Forkston. It represented a change in terms from five to two years. The county will receive $6,000 per year from Chesapeake with a three percent annual increase. Before the discussion on emergency responders was completed, Commissioners Henry and Mead noted that Wyoming County EMA and 911 responded to the recent communications crisis in Bradford County resulting from a wind storm that toppled trees county-wide, disrupting phone and internet service there for more than a week. In addition to providing relief for Bradford County EMA personnel, Dziak (above, right) and Porter took needed generators and an emergency phone system to Bradford County, where the construction of a new public safety center is slated to begin in 2018. Henry noted that Bradford County officials were impressed with the equipment Wyoming County had on hand and have asked for a tour of the Wyoming County facilities.